Marie Laurent was a French driver who was most known for her membership of Team Aseptogyl, and her performances on-track in a Chrysler Hemicuda in the 1970s. She first appears on the entry lists in 1970, competing in hillclimbs, although details of this are sketchy. Her car was a Simca. Next, she raced on the circuits, winning the French Simca Challenge in 1971. Her car was a CG Proto. Early in the season, she raced the car in some rounds of the Championnat des Circuits in France, finishing fifth at Albi, and tenth in the Coupe de Printemps at Montlhéry. 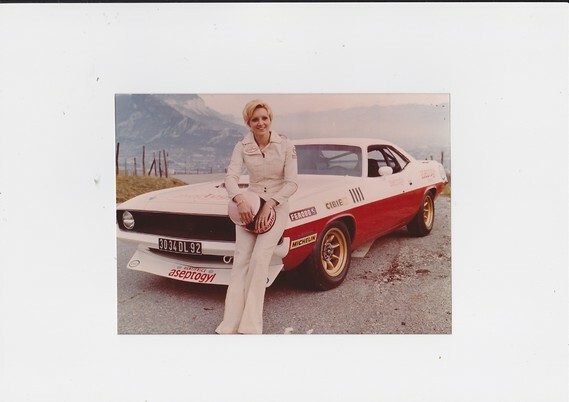 As well as providing her with her first championship, the Challenge brought her into contact with Jean-Claude Géral, the 1970 winner, who sold her a 1970 Hemi-engined Plymouth Barracuda, known as a Hemicuda and used to great effect by the French Chrysler team. The pair raced the car together at least once, at Magny-Cours, during a round of the Championnat des Circuits. Driving solo, later in the season, she was third at Paul Ricard and second at Montlhéry in the Hemicuda, behind Géral both times. In 1972, she drove the enormous, 7000cc Hemicuda in the Championnat des Circuits. Although she was unable to match the dominant sportscars of the series, she was one of the front-runners in Group 6 and the National section. She won at least one race, the Coupe de Salon on the old Montlhéry circuit, and was second in at least one other, behind Frank Alesi in a Chevrolet Camaro. As well as the Championnat, she competed in hillclimbs, finishing second in class at Mont Ventoux and third overall at Chamrousse, in the Hemicuda. The results for the National part of the 1973 Championnat des Circuits are proving very hard to find. It seems likely that Marie raced the Hemicuda in at least some of the rounds. Hillclimbing was definitely still on her agenda, and she competed at Ampus in a Ford Capri, finishing in 39th place. For the first part of 1974, she was once more one of the front-runners in the Championnat des Circuits. She was second in the Group 1 race at Montlhéry, fourth at Nogaro, then second again at Montlhéry, after a battle with Marie-Claude Beaumont and Henri Greder, both in Opel Commodores. Apart from one more non-finish at Montlhéry, her season in the series ended there. The Hemicuda was not the force it once was, compared to the Alfa Romeos and Opel Commodores that now dominated. She was tenth in the championship. Despite the big American car being a little outdated on the circuits, it still remained competitive on the hills. This year, Marie competed in hillclimbs as part of Team Aseptogyl, Bob Neyret’s all-female, toothpaste-promoting rally and race team. For the Tour de France, she paired up with another Aseptogyl driver, Marianne Hoepfner, in an Alpine A310. They were thirteenth, and won the Coupe des Dames. In June, she was part of another all-female team, for Le Mans this time. She was part of Christine Beckers’ Ecurie Seiko Scato, sponsored by a watch firm. The other team members were Christine Beckers herself, and Yvette Fontaine, both Belgian. Their car was a Chevron B23. They were seventeenth, and won the 2000cc class, which was the best finish for an all-female team since the 1930s. After 1974, she raced less frequently. Despite her success, she did not return to Le Mans, and Team Aseptogyl concentrated more on rallying as the 1970s progressed. She took part in some occasional road races and hillclimbs, in different cars. In 1977, she was 29th in the Ronde Cévenole, driving an Alpine 1300. The latest result available for her is a 20th place in the 1979 Mont Dore hillclimb. Unusually, she was in a single-seater, a Ralt RT1. Some time around then, she married Jean-Pierre Gabreau, another racing driver, and had a daughter. She died in 2015, at the age of 71, after having been ill for a long time. Wow! She seemed like quite the racer. I love reading about the early women, and wish I could sit down with more of them to listen to their stories. It must have been so different then that it is for the ladies out here now. Thanks for stopping by #FastWomenFriday!